Abortion and the death penalty: Why does Texas protect pharmacies that sell execution drugs? Is Texas Covering Up After-Birth Abortions? Gov. 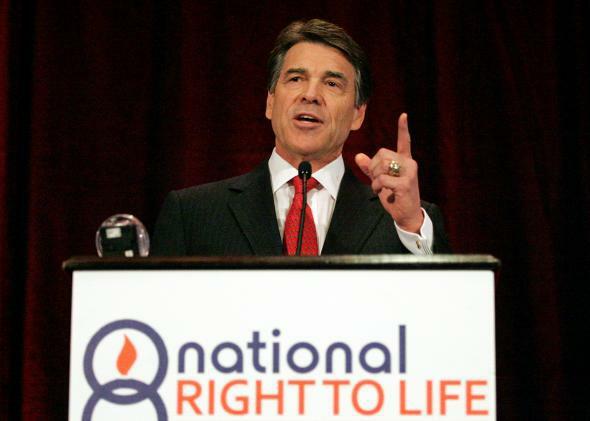 Rick Perry, R-Texas, at the National Right to Life convention, June 27, 2013. Texas is a pro-life state. If you sell drugs that kill unborn babies—or, to be a bit more technical, if you offer nonsurgical abortions using an FDA-approved combination of mifepristone and misoprostol—the state will demand lots of information from you. It will also provide information about you to the public. Citizens are entitled to know what you do. If, however, you sell drugs to the state for its favorite pro-life activity—killing fully born people who have murdered others—the state will protect you. It will hide your complicity, even under direct questioning. The state keeps individual medical records private. But it releases other information. Under section 245.005, “Information regarding the licensing status of an abortion facility is an open record … and shall be made available by the department on request.” Under section 139.6, the state must make “available to the public … the date of the last inspection of the facility,” and it must “maintain a toll-free telephone number that a person may call” to get information about licensing, inspections, and incidents. Pro-lifers use these open-records laws a lot. Several years ago the Houston Coalition for Life got letters from a local Planned Parenthood attorney through an open-records request. Last year, when Texas was considering the bill that imposed new information requirements on providers of abortion-inducing drugs, a leading pro-life activist exulted that the bill’s doctor-availability rules would shut down a clinic’s ability to offer those drugs. She also discussed information she had gathered about “abortion clinics across the state” through the open-records laws. You’d think a state with such extensive reporting rules for first-trimester abortions—and even more extensive reporting rules for third-trimester abortions—would be curious, or at least candid, about the taking of human life in, say, the 120th or 160th trimester, when the targeted person is 30 or 40 years old. But you’d be wrong. According to the Associated Press, the Texas Department of Criminal Justice is refusing to disclose the pharmacy from which it gets drugs for lethal injections. Texas has executed more than 500 people since 1982. Last year it killed 16. So far this year, it has killed three more. Five other executions are already on the calendar. To complete them, the state needs pentobarbital or other sedatives. But drugmakers don’t like to be associated with death. Many of them have refused to sell potentially lethal drugs to prison authorities in states that practice capital punishment. So Texas has turned to local pharmacies for its supply. This week the state confirmed that it had received a new shipment of pentobarbital. When the AP asked who had supplied it, a spokesman for the criminal justice department refused to say. “We are not disclosing the identity of the pharmacy because of previous, specific threats of serious physical harm made against businesses and their employees that have provided drugs used in the lethal injection process,” said the spokesman. He cited protests by death-penalty opponents against a Houston pharmacy that previously supplied lethal drugs to the state. Imagine that! Protests against a provider of lethal drugs. I don’t recall Texas getting so worked up about pro-life demonstrations or harassment when they’ve targeted abortion clinics. You can’t have it both ways, Texas. If you want to argue that abortion is wrong but capital punishment is OK, go right ahead. But good luck explaining why we’re allowed to know about one and not the other.